Takeaway: Moving from Kakasana (Crow Pose) to Bakasana (Crane Pose) isn't as simple as just straightening your arms. Try these tips to learn how to find balance and advance from Kakasana into Bakasana. I still remember my excitement the first time my feet lifted off the ground as I moved into the previously elusive kakasana, or crow pose. The tip that did it for me came from a new yoga teacher. The zen trick, he told us, is not to think “up,” but to think “forward”. And with this guidance, and a blanket for a crash pad in front of me, I did indeed find the magical tipping point. My weight shifted to rest onto the backs of my chaturanga arms and my feet became weightless. In time, I began to both relish and dread this posture in equal measure. I enjoyed the challenge of holding crow pose for longer and longer periods of time, and playing with shooting my feet back to land in chaturanga. However, the more confident I became, the more I noticed teachers were keen to tell me: “The next step is to straighten your arms.” That sounded great, but how exactly was I meant to straighten my arms when the entire weight of my lower body was pressing into them? Yoga has helped me build my upper body strength, but not that much! Trying to straighten my arms even a millimetre was impossible. My body felt so heavy and unwieldy that I began to question whether maybe my pelvis was freakishly dense. Finally, it was a fellow student, who seeing my frustration, leaned over and whispered: “Try putting your knees more into your armpits.” And suddenly I understood. 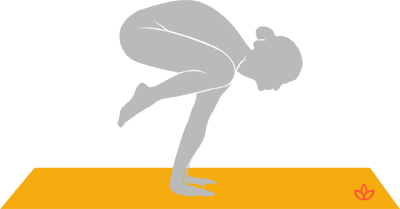 It turns out bakasana or crane pose may look very similar to crow pose to the uninitiated eye, but it’s actually a whole other posture. What’s the Difference Between Kakasana and Bakasana? In kakasana, the arms are in a chaturanga position, elbows bent with the knees resting on the triceps, or slightly outside the triceps, squeezing in towards them. Once you’ve mastered chaturanga, you’ve more than likely got the strength for crow pose. (Haven't mastered chaturange yet? Learn How to Hold Proper Chaturanga Alignment.) The trickiest thing, as I found, is moving your centre of gravity far enough forward that your feet lift naturally without you having to make little bunny hops and invariably falling straight back out. Warm and mobilize your wrist joints first. Bakasana requires greater wrist flexibility and strength to keep your arms straight. Practice wrist releases while on all fours or seated, as well as circling the wrists, interlacing the fingers, and making a wave-like movement through the forearms and hands to lubricate the wrist joints. Lift the knees as high as you can into the armpits and keep the arms as straight as you can. It’s much harder to straighten the arms if you begin with them bent, so try imagining that you don’t have any elbows. One trick to get the knees higher up is to reach your arms up in the air first, extending them straight, then take the hands forward and to the ground, keeping the arms straight and hooking the armpits over the knees as you do. Change the way you think of the energy of the posture. Instead of imagining the weight of the body resting into the arms, think of the point of contact between knees and armpits as a pivot point around which you tilt the hips and legs high while keeping the hands grounded. Lift your hips higher than you think you need to. In comparison to kakasana, where everything can stay quite low to the ground, bakasana is a much “airier” balance. As you place the knees into the armpits, come right up onto your tiptoes, and lift your pelvis high. Engage engage engage. One challenge with advancing to bakasana if you’re used to kakasana is realising how much more core and arm strength you need to muster to hold the posture and stop your knees from sliding down or your arms engaging. If in doubt, taking some time to practice some core strengthening moves to help make the posture easier. What if You're Still Working on Kakasana? Use a blanket as a crash pad, or even better, practice in front of a wall, propping a pillow or a bolster up on the wall for you to rest your head against. This can help you find the balance point, as it’ll give you the confidence to move forward without the fear of toppling. Experiment with different foot and arm positions. All bodies are different, so what works for your yoga mat neighbour may not be right for you. Explore the options, and see what sticks. Try resting your knees on the shelf of your upper arms, or take them slightly wider and squeeze them in. Keep your heels together as you lift up, or allow them to be hip width apart. Try placing your feet on a block, or be really brave and try placing your hands on blocks as you come into the posture. There are so many variations you can play with. Build strength, especially in your arms, shoulder girdle and core. Kakasana is not a posture to come into cold. Get your muscles fired up first with core strengthening postures, such as plank and navasana, and chaturanga dandasana and dolphin pose to warm and engage your shoulders. Stay relaxed. As with any balance posture, the more frustrated you become, the harder it gets. So take a break, make a cup of tea and visualise your crow effortlessly taking flight - you might just surprise yourself next time you try it! Whichever variation you’re playing with, practice holding it for two breaths, then five, then ten, working up to 60 seconds. You’ll be amazed at the difference building strength, balance and confidence in this pose can make to the rest of your yoga practice.